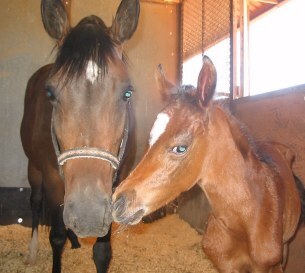 MP Emma greeting her new foal, "EmmaLee" who was born on Mother's Day (May 11) 2008. 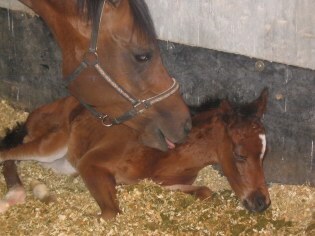 Mom was sneaky and despite having a camera in the barn, managed to have EmmaLee about 4:00 a.m. without anyone knowing. Those 1st time Moms can be like that! A kiss for my mom -- I love her!